As we were leaving the hospital where my eldest son, William, was born in 2011, I looked down at my baby buckled in his green car seat for the first time and snapped a photo. It was one of my favorite images of those newborn days and it spent a few months on our fridge before being replaced by new images of his ever-changing face. Thirty-one months later, my youngest son Santiago joined us. 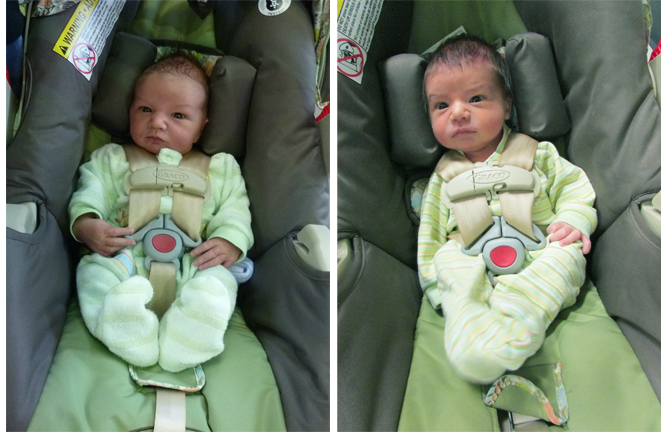 We were leaving his first doctor’s appointment and, as my husband got us checked out, I looked down at my newborn, who’d brought the green car seat William had discarded back into circulation. Santiago looked up and I stared dumbfounded for a few seconds as I willed my exhausted post-labor brain to tell me why the image seemed so familiar. I snapped a photo and only then remembered the old snapshot of William that had long resided in a box in our living room. When I got home, I found the digital version of William’s photo and placed it next to the one I’d just taken of Santiago. The resemblance, not only in features but in expression, was uncanny. Although my husband, Nate, could tell the boys apart, the boys’ grandparents could not. I posted the photos side by side on Facebook, where they created quite the stir as friends and family responded by sharing stories of how similar—or not—their own children were. Weeks passed in that sleepy haze of nursing and gazing into the baby’s face for hours on end. Then one night when both boys were restless and kept waking me up, my overtired mind kept coming back to the two photos, now framed together in our living room, as I tried to fall back asleep. As the morning broke, I envisioned a film version of those photos. What if I filmed the boys doing the same thing at the same age during their first year of life and put it side by side on the screen? I knew it would be a project that would mean a lot to our family, but I thought it would also resonate with parents around the world. From my experience, most parents who have more than one child try to figure out just how similar their children actually are. Doing that, however, usually requires piecing together our memories of an older child with what a younger child is doing in the present. A complicated yet delightful game that parents have been playing for millennia. By using the vital piece of my memory that my camera and the footage it captures have become, I tried to play the game in a new way by using filmed images of the boys to help me figure out how similar they in fact are. I had begun my filmmaking career two years before William was born, and once he joined us I assiduously filmed his development. Nate would also pick up the camera and capture William in his own playful style. Every couple months I edited a short video that told the story of our lives together, and which I shared with family and friends. When the idea of William and Santiago Simultaneous came to me, I knew that I had hours of footage of William that I could turn to for this project. The key was to find the footage I liked and recreate it with Santiago without having the visual connections I was drawing seem forced. When I first envisioned the film, my plan was to have both boys do the same thing at the same time, but Santiago had his own timeline in mind. While he was more vocal than William, he was in no rush to develop his gross-motor skills. I was—foolishly—expecting Santiago to roll over, sit up, and crawl at the same time as William. When I realized that Santiago was going to do things whenever he felt like it, film or no film, I had a few days of panic when I wondered how I was going to complete the project if the main idea wasn’t working as I’d hoped. Then I laughed at myself. I hadn’t set out to prove that siblings are exactly the same but to find out how similar they in fact are. In the case of my children the answer was: not as similar as I’d expected. Now I had to figure out how to tell that story with the project constraints I’d created for myself. Showcasing their differences in timing proved one of the most creatively satisfying and liberating aspects of the project. Besides hoping to answer a question, this film also seeks to capture the immense joy, experimentation, and confusion that emerge from learning to be a human being. Watching our boys figure out how to make sense of their bodies and their emotions has been one of the most transcendent aspects of being parents for my husband and me. Now we’re happy to share that adventure with you.